This book is a “must have” for any one interested in the lower Pine Creek Valley. 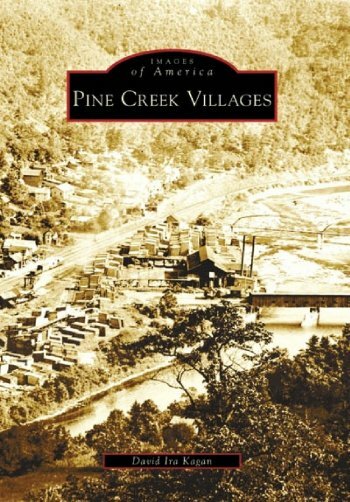 Authored by local valley resident Dave Kagan, it provides a written and photographic journey through the villages of the lower canyon of Pine Creek. The villages were established during the lumbering area and still remain today. The thousands of lumbermen who populated the area during its peak lumbering activity have moved on, but the quaint villages remain. Trains that once hauled boards and goods through the valley have been replaced by a much quieter mode of transportation, the bicycle. The Pine Creek Trail replaced the old rails that carried the trains through the valley, and today the rail bed provides a wonderful bike path along beautiful Pine Creek. Of course, the trail goes through the scenic villages, which Daves book covers with beautiful old photos and exciting written text. Available at Wolfes General Store Signed copy: $21.99 + tax.